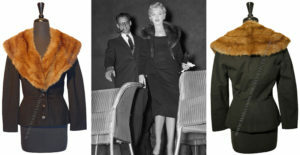 Marilyn’s clothing in this collection represent the private woman as well as the glamorous movie legend. Highlights include the green Pucci blouse she wore when the last ever photos of her were taken the weekend before she died, a simple house dress she wore when she was pregnant in 1958, and the glamorous evening cape she wore to the premiere of “East of Eden” on March 9, 1955. All items come directly from the Marilyn Monroe estate. Click on a link below for additional details.